Daring, unique, playful are just a few words that come top of mind when experiencing one of Chef Yann Lejard’s signature dishes. Like a modern-day disruptor turning the simplicities of food into plated works of our art, his talents have taken him across Europe, into major Michelin Star restaurants, before arriving to the region, first in Saudi and then to the Kingdom of Bahrain in 2014 where he assumed the role of Chef de Cuisine for the award-winning Plums restaurant. 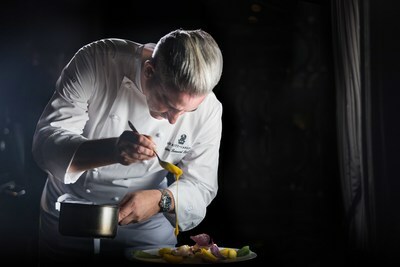 Proving his leadership with a promotion to Executive Sous Chef in 2016, in his new role as Executive Chef of the five-star Ritz-Carlton, Bahrain, Lejard will oversee a culinary team of 130 chefs, along with the menu creation and kitchen operations of the resort’s 11 restaurants, in-room dining and banquet catering divisions. Born in Paris, France, Lejard began expressing himself through street art, taking inspiration from the likes of modern art legend Jackson Pollock (1912-1956). Eventually becoming a chef by the age of 16, it was then where he found food to be a catalyst for artistic expression and where his signature, abstract style of ‘splattering’ sauce on a plate was born. Fast forward to the era of social media, Lejard’s accounts @YBLinc have since amassed a foodie cultist following of 120k fans, and those who can’t wait to see what he does next. “He is a master of art and a disruptor in the food scene with a following of admirers on social media to back it up. He, as well, has the creativity and mastery to take our large dining portfolio to pure excellence. His hands on leadership and mentorship of the entire Ritz-Carlton, Bahrain kitchen brigade has been superb, so it was a natural choice to promote him to the next level,” says Bernard de Villèle , General Manager of The Ritz-Carlton, Bahrain. Catering to the most discerning epicurean connoisseur, the resort offers both modern and international dining experiences with its award-winning restaurants, including: Cantina Kahlo (Mexican), Nirvana (Indian), Plums (Steakhouse), La Plage and Bar de Plage (Beach cafe), Thai (Asian Fusion and Sushi), La Med (Mediterranean) and Primavera (Italian). For leisurely dining moments or for afternoon tea, The Lobby Lounge and the Ritz Gourmet Lounge offer guests à la carte café and dessert options, while Burlington Club entertains a more sophisticated ambiance perfect for enjoying vintage spirits, premium cigars, modern cocktails (and mocktails) and light bites. In-room dining is also available to guests’ 24hours a day. A variety of guest amenities abound with a private beach sweeping around a lagoon with its own island, outdoor and indoor swimming pools, an award-winning Ritz-Carlton Spa, Royal Beach Club, elevated Ritz–Carlton Club® Level lounge with panoramic views of the Arabian Gulf, newly enhanced marina, 24-hour fitness center, paddle boarding and kayaking rentals, Ritz Kids clubhouse, tennis and squash courts, business center, flamingo lagoon, Concierge desk with Les Clefs d’Or® Head Concierge, men’s and women’s hair salon, and shopping arcade with six luxury boutiques. In addition to the leisure setting, the resort also features over 20,000 square meters of meeting, conference and wedding spaces. New additions to the venue portfolio include the Masaya and Arena pavilions’. For additional information about The Ritz-Carlton, Bahrain, please call (800)-00995, the hotel directly at (+973)-1758-0000, a travel professional or visit The Ritz-Carlton website at ritzcarlton.com/Bahrain.